Enjoy your vinyl records wirelessly and digitally store them with the Sony PS-LX310BT Stereo Turntable. Its USB output allows you to connect it to your computer for convenient connection and conversion, while built-in Bluetooth connectivity lets you stream your vinyl audio directly to your compatible wireless headphones or speakers. 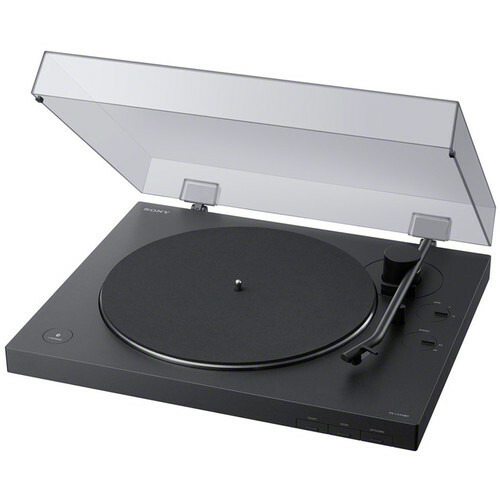 The turntable supports 33 1/3 and 45 rpm speeds and features a stereo RCA audio output that can connect to a preamp or directly to your sound system. Enjoy vinyl playback with wireless connectivity via Bluetooth and controls designed for simplicity. The turntable can pair with your favorite Bluetooth speakers or headphones. Adjust the gain switch to match the audio level of your record and to help reduce distortion. With the automatic playback function, the turntable will automatically lower the tonearm, find the groove, and start playing through your paired Bluetooth device. The straight, aluminum tonearm is designed to boost traceability for stable playback with clear sound and powerful bass. The dust cover is engineered to muffle acoustic pressure from your speakers to help enhance stability and reduce distortion. You can also remove the dust cover, if you prefer. The aluminum die-cast platter is designed to be robust, yet lightweight, so it can stay stable as it rotates for clear playback. The 45 rpm adapter is stored in a slot beneath the deck, so it can be hidden away when not in use.